“I have a shoebox and—I have two of them actually. And every time I have an idea for a scene or a scrap of dialogue, or even just a snippet of an impression I have that seems to connote something in my head, I’ll put it in a shoebox. I’ll let six months go by until there’s all these accumulated papers in there. Napkins and business cards and everything that’s scribbled on and I dump it out. And I read through all of the things I’ve collected in the last six months. And some of the things you don’t even remember writing and you can’t even interpret what in the hell it means. Just see if anything connects. Just see if there is a thread that runs through any of the things that obviously that you’ve been thinking about or has been recurring in your subconscious in the last six months. You see what jells—what suggests a shape. P.S. The above photo is actually a Nike shoebox of mine that has various ideas for screenplay ideas I’d like to explore. Because I played a little football back in the day, there are always themes there that I like exploring. 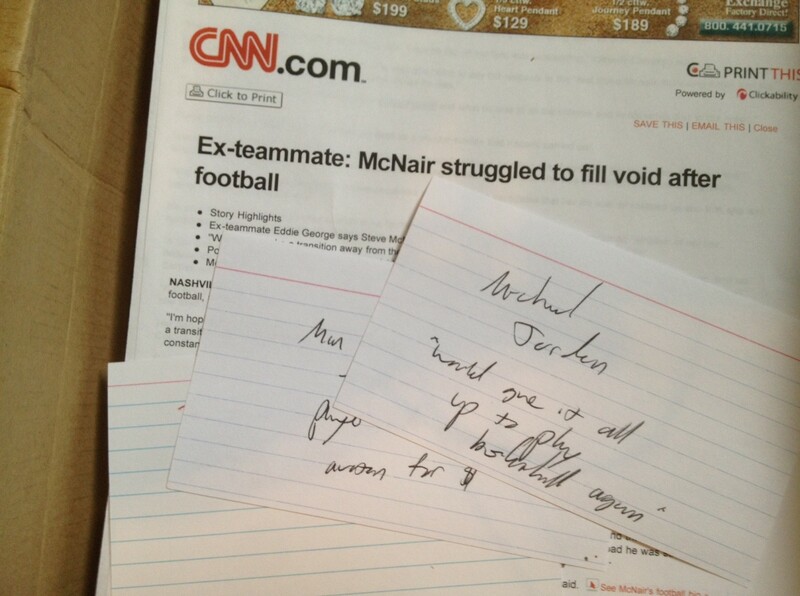 The CNN article was written in 2009 after former NFL quarterback Steve McNair (whose nickname was Air McNair) was killed by his mistress in a murder-suicide. Then earlier this year I read an article about NBA great Michael Jordan who was quoted as saying basically he’d give up all his wealth and fame if he could just play professional basketball again. And that isn’t just an idea that has been percolating in my brain for the past five years, it goes back more than a decade. The box has various articles and ideas including an insightful Sports Illustrated piece about former Cleveland Brown QB Bernie Kosar and how he went through the $50 million he made before filing for bankruptcy. (Kosar says he was good at making money, but not good at keeping it.) In my shoebox are reports on the lingering effects of head injuries on NFL players. Former players who’ve committed suicide. Index cards that read things like “Watch North Dallas Forty“ and “Watch The Electric Horseman”—a 1979 Sydney Pollack directed and Robert Garland written movie starring Robert Redford who played a former rodeo star trying to hold on to his dignity. I don’t know if all those notes, thoughts, and articles will ever lead to a screenplay—but that’s all part of the process. Judd Apatow (This is 40) types notes/ideas/dialogue on his phone and David O. Russell (Silver Linings Playbook) says he “tricks himself into writing” by emailing ideas to himself. So whether it’s a shoebox, a corkboard, cell phone, or email—find what works for you to gather ideas and move forward with writing your screenplay. “Because I have a son who’s had some of these emotional situations I immediately related to [the novel Silver Linings Playbook] otherwise I never would have. And I said, what a wonderful story, and a wonderful world that is tragic, heartbreaking, emotional, and ultimately funny and uplifting….While I was waiting the five years to make it, I probably rewrote the script over 20 times, and I was able to plumb new depths of it in terms of calibrating the nature of the challenges the main character faces. So far more than 400 students have participated in the 15 month film program. The not-for-profit school has a well-connected Board of Directors, Filmmaker Council, and Advisory Board that includes Mark Wahlberg, Edward Burns, Spike Jonze, Lee Daniels, and Evan Shapiro (President of IFC TV and Sundance Channel).